Nordic Aquafarms Inc. (NAF) is holding a Public Information Meeting on Tuesday, March 26, 2019 at 6:00 p.m. at the Hutchinson Center, 80 Belmont Ave in Belfast, for its last permit submissions. In the meeting NAF will present key information from its Site Location of Development Act (SLODA) and Natural Resources Protection Act (NRPA) permit applications, as well as high-lights from the previously submitted discharge application where two information meetings were held in Q4 2018. NAF will take public comment as input to the permit applications. Final submission of outstanding applications will occur shortly after the information meeting. The discharge, or MEPDES, permit application was filed with the DEP last October. Pursuant to Maine DEP rules, a formal notice of the meeting was published in the Bangor Daily News and letters were sent to project abutters by certified mail. Maine Legislature’s Joint Committee on Agriculture, Conservation and Forestry recently held a public hearing on LD 620, An Act Regarding Licensing of Land-based Aquaculture Facilities. The bill was unanimously voted down in the legislature. Nordic Aquafarms Inc. supports strict environmental standards that are predictable for investors in Maine, and we will continue to work with the authorities on this matter. Strict standards will ensure that Maine is able to position itself as a premier state for sustainable aquaculture. 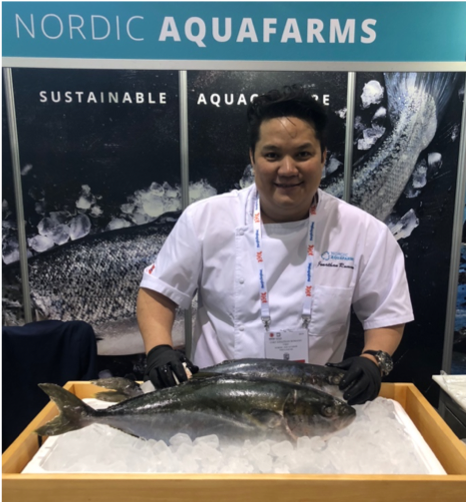 Nordic Aquafarms Inc. also published an Op-ed in Bangor Daily News that focused on the fact that Maine can have both environmental stewardship and aquaculture innovation. The annual Seafood Expo North America / Seafood Processing North America is North America’s largest seafood exposition. The three-day event, produced by Portland-based Diversified Communications, brings together thousands of buyers and suppliers from around the world to meet, network and conduct business. The attendees represent importers, exporters, wholesalers, restaurants, supermarkets, hotels, and other retail and foodservice companies, and individual suppliers, as well as states, regions and entire countries which have a major presence at the event. Nordic Aquafarms Inc. was pleased to be an exhibitor this year. Our exhibition featured our operations in three different countries, our game-changing RAS designs, and our Yellowtail Kingfish from Nordic Aquafarms´ subsidiary Sashimi Royal in Denmark. Sushi-chef Jonathan Romano made delicious servings of Sashimi which turned out to be a big hit among the participants at the expo. 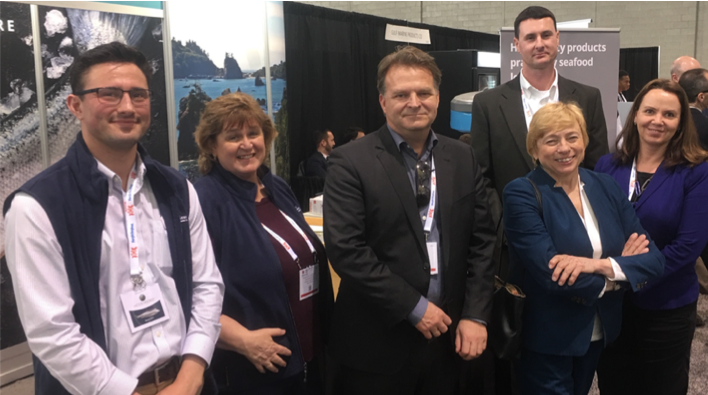 Governor Janet Mills also visited NAF´s booth at the Boston Seafood show and the prospect of a land-based aquaculture industry growth in Maine going forward. The Norwegian Consul General from New York, Harriet E. Berg, also stopped by our booth to wish us well. Nordic Aquafarms Inc. (NAF) was also pleased to participate in the annual Maine Fishermen’s Forum in Rockport earlier this month. Each year in early March, the Forum brings together fishermen, gear suppliers, scientists, government officials and other stakeholders to collaborate on markets, the status of the resource, regulations, the latest in technology and the environment. President Erik Heim, Commercial Director Marianne Naess, Chief Technology Officer David Noyes and Production Manager Carter Cyr were at the forum interacting with members of Maine’s marine community. NAF had a booth at the forum, which gave us a great opportunity to meet many of the players in Maine’s fishing industry. We answered questions about our salmon farm and described how it will become an important part of Maine’s future seafood economy. We also spoke with members of the lobstering community about our initiative to have heads, racks and other by-products of land-based facility approved for bait, one of the most pressing issues facing the lobster industry these days. The response from the lobstering community has been very positive in the midst of bait supply challenges. Maine’s U.S. Senator Angus King stopped by to say hello again and wish us well. John Hessler recently came on board with Nordic Aquafarms Inc. as the project engineer for the construction of the Belfast facility. 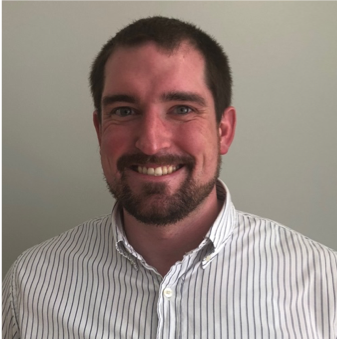 John is a resident of Maine, he was raised in Ellsworth and attended The University of Maine where he obtained his bachelors´ degree in engineering in 2011. John spent several years conducting graduate research in the field of energy and fuels at the Georgia Institute of Technology in Atlanta, GA, before returning to Maine. John currently lives in Ellsworth, where he enjoys spending time with family and exploring the Maine outdoors. Erik Heim Accepts Patriotic employer award for Nordic Aquafarms Inc.
Nordic Aquafarms Inc.´s president Erik Heim was awarded the Patriotic Employer Award at a ceremony in Augusta on Sunday March 3. Long term service in the National Guard and Reserves often creates challenges for employers. For national guard members finding a good employer who supports the commitment to military service can be difficult. When Sergeant First Class Noyes described the typical training requirements when hired, Nordic Aquafarms Inc. displayed flexibility as an employer to accommodate military activities. “I was floored by the gesture” says SFC Noyes. “We barely discussed the subject, I gave Erik Heim a copy of my drill schedule, and expected it might cost me the position I was interviewing for. Instead I was offered an employment contract with an extra two weeks paid time off for training. He never mentioned it again after my interview, but I certainly remembered”. On Sunday Sergeant Noyes was able to present his employer with a token of his gratitude for the support his company has offered him. 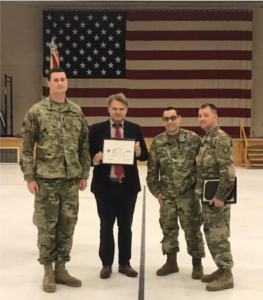 “Nordic Aquafarms Inc. have made it abundantly clear that they fully support me serving in the Maine Army National Guard”.